Hundreds of thousands of protesters in Egypt take to the streets demanding change from what they perceive to be an unresponsive government. United States President, Barack Hussein Obama is so moved that he calls the President of Egypt urging Mr. Mubarak to step down from his office, perhaps immediately. He then steps to his powerful presidential podium and speaks to the protesters in Egypt saying President Hosni Mubarak must begin a transition immediately toward a new government, and assured protesters "we hear your voices". He continued on to say, "To the people of Egypt, especially the young ones, I want to be clear: we hear your voices. I have an unyielding belief that you will seize your own destiny." How arrogant is it that this president thinks he can simply inject himself into the political debate of the sovereign nation of Egypt? Think back now to the summer of 2009 when hundreds of thousands of protesters took to the streets of Washington DC and cities all across this nation to protest the Obama Healthcare Bill that was passed anyway, against the will of the majority of the American people. 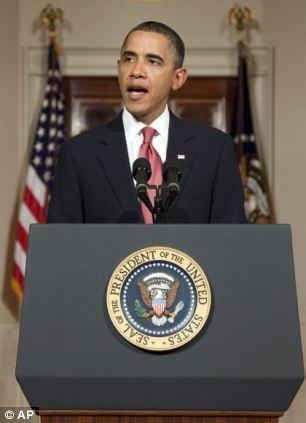 Did President Obama take to his all powerful, all seeing, presidential podium and say, "we hear your voices"? No, he didn't. Did he say "You will seize your own destiny"? No, he didn't. Did he get on the phone and call Nancy Pelosi and Harry Reid and advise them that they make an immediate change in course? No, he didn't. In fact, the White House unbelievably declared that it wasn't even aware of the protest rally that received nationwide coverage in advance of the rally. White House spokesman Robert Gibbs said, "I don't know who the group is." Imagine if President Mubarak, or the leader of any other country had gone on international television and told the Tea Party protesters, "We hear your voice" and called on President Obama to step aside as President of the United States? What is wrong with this man, that he is so willing to listen to the will of the people; but only when it is the will of people outside of his own nation? What level of self-importance must he have to believe that the people of Egypt will actually stop their protests because "we hear your voices"? And what level of hypocrisy is it that he can respond to the protesters of Egypt and completely ignore even larger protests from American citizens? Mr. President, I advise you learn to listen to the people of this country. You know, the ones who actually pay your salary. Perhaps we should demand that you step down immediately, like you are demanding of the President of Egypt. Listen to US Mr. President. It is our nation you swore to defend. What is wrong here is that you have not an inkling of what is going on in the international issue of Egypt because you are too busy Obama -ashing and twisting every piece of news to suit your goal of Obama-bashing to care about anything outside of your own egotistical views and small town mindset. Egyptians WANT the United States to stop backing a tyrannical despot and WANT him to address the issue. Our country sends A LOT of money in aid to Egypt and as a result supports a cruel reign of suppression against Egyptian people and prevents them from having anything like our own freedoms- to have free speech & elections that aren't rigged for starters. So they have grievances with us, and directly with our President(s), for many years now. 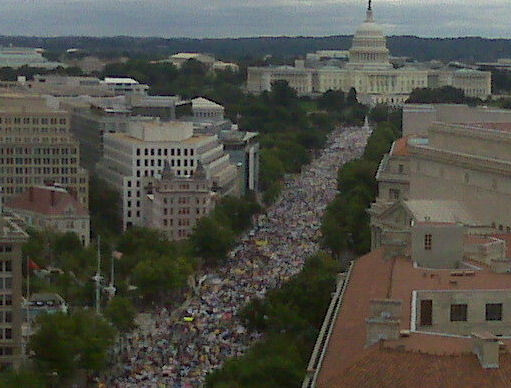 ----A minor protest against healthcare is ridiculous. President Obama was elected by the majority, that majority wants healthcare, end of story. Sorry if you can't see that allowing sickness and poverty to destroy this country like a cancer needs to be stopped. Why don't you talk about both sides of the issues in a balanced way? Minor protest?? Majority wants healthcare? YOU ARE WRONG. Look at ANY poll and they all show that the MAJORITY do not want Obama's healthcare law - which is not at all about health care but about taking over 1/6th of the economy and the government/bureaucrats telling us how to live. What planet have you been living on? There are people who seem to think that the government providing them healthcare is a right - IT IS NOT a right. People should be responsible for themselves. Tell me Finchy - how long to you think your "free speech" will continue to be a freedom if Obama stays in office? His czars are already trying to limit your rights on the Internet and are trying to find ways to further regulate guncontrol. You don't think that "rigged" elections happen here? You are fooling yourself. How do you think Harry Reid got reelected? How do you think the 2012 elections will go? If Obama gets reelected it will be because the unions used every dirty trick in the corrupt book to pad the votes. It simply amazes me that there are people who think like you do - you know - unrealistically and blindly. Exactly the type of person who Obama panders to. The uneducated, minorities, illegals, deadbeats and the young and impressionable and those who want government handouts. Why don't you start paying attention to the Obama-bashers - you might learn something. Actually Oblabla was not elected by a majority of the voters, since less than 55% of eligible voters voted. And you are completely wrong about the majority wanting the healthcare debacle that the U.S. Congress passed. While many want healthcare reform, what we were given is not what is wanted. The situation is only going to get worse even faster under Oblablacare. Get a clue! The only reason most people don't like Affordable Care Act as passed is because of the ridiculous compromises the Democrats had to make just to get the thing passed. Most Americans want a health care solution that goes much farther towards socialism than the current ACA. You claim to be speaking for the People, but most Americans are like me, not like you. Most Americans are sorry they ever let your side have control of the House, the Senate, and the Presidency at the same time. Absolutely clueless and dilusional. You live in your own little fantasy world when you think anyone would be dumb enough to support a system that steals from businesses and tax payers just to provide HC to those who already get it free when the need it. It will never pass and you LIB are screwed!!! You took the words right out of my mouth, Yellow Rose. I am just amazed at the way some people in this country think today. If these same liberals acted this way during WWII, we would be either speaking Japanese or/and German as our national tongue. What is wrong with you Obama supporters?! You remind me of a woman who has battered wife syndrome. Obama and the Democrats keep abusing this nation with lies and "back door" deals but his supports keep supporting him anyway! I'm registered as an Independent because I distrusted both the Republicans and Democrats. Left wing radicals want to "change" this nation, mold it like clay to their vision. But what is their vision. Their actions show what their vision is and it's frightening, for us and the future generations of our great country. Wake up Obama supporters! Don't late your hatred over the Republicans or the Tea Party ruin this nation! Be strong and Smarten up!! Yes, you are absolutely right, the health care reform that passed was unpopular—because it lacked a more robust non-commercial alternatives: a public option, expansion of medicare, and even single-payer have all polled well. Obama is not a leftist or a socialist, he is a corporate capitalist as are nearly all American politicians are (Senator Sanders is a lone exception). Utterly preposterous is your equation of the tea-bagger protests with what is now occurring throughout Egypt. Obama was democratically elected and had hardly served a year before the over-exposed tea-bagging affair began. Mubarak is a repressive dictator who has ruled Egypt for thirty years. If you can't see the difference you are fool.